You may have heard recent dire reports about the health of bees and butterflies. Whether it’s the declining number of the amazing Monarch Butterfly or the constant reports of “colony collapse disorder” in beehives, these reports are alarming. One of the best and easiest things you can do to help these crucial creatures survive and thrive is to plant the perennials, shrubs and trees in your landscape that will give bees and butterflies the food they depend on. Help these pollinators while creating an inviting outdoor space for yourself. Or, if you are pondering the possibility of updating your landscaping in the near future, let Outdoor Design Group design a bee and butterfly friendly garden for you. Below are listed several different perennials, shrubs and trees that provide food for bees, butterflies and other pollinators. While I’ve listed several pollinator friendly plants here, there are still many more to choose from. Consult the Xerces Society, a nonprofit organization that protects wildlife through the conservation of invertebrates and their habitat, or your local university extension agent for more suggestions of pollinator friendly plants that will grow well in your area. Asclepias species. Commonly referred to as the Milkweeds due to their milky sap, there are many species in the Asclepias genus that are utilized by butterflies and bees. Many biologists believe that the decline in the Monarch butterfly population is directly correlated to the increasing use of herbicides used to kill Milkweeds in North America, because Monarch butterflies depend on Milkweeds as food for their larvae. 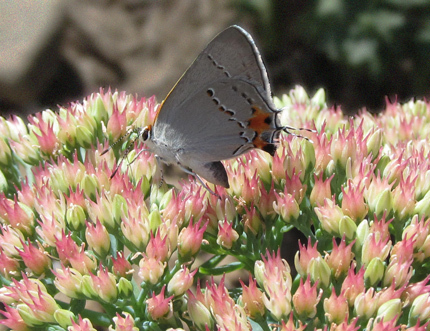 There are many Asclepias species that grow in North America, but two that do well in Colorado are Asclepias tuberosa (showy milkweed) and Asclepias speciosa (butterfly weed). Ht. and Wd. varies depending on species and cultivar, generally 15-60” Ht. x 12-18” Wd. The Mint Family (Lamiaceae). Many familiar and popular garden plants from the so-called Mint Family are favored by bees. Some of these are culinary sage, Russian sage, mint, basil, rosemary, oregano, thyme, lavender, lamb’s ear, hyssop, lemon balm, and bee balm. Ht. and Wd. varies depending on species and cultivar. Sedum ‘Autumn Joy’. This tall stone crop flowers in mid to late summer (see photo above), making it a good late-season nectar source for pollinators when many other plants have stopped flowering. 18-24” Ht. x 12-18” Wd. Datura wrightii Although Sacred Datura may not always be a perennial in all parts of Colorado, depending on the severity of the winter, bees love it’s flowers which emit an amazing scent, so even if it is frost tender and may need to be regrown from seed in colder areas, it is worth it. The bees will thank you. 18-24” Ht. x 6-8’ Wd. Buddleia alternifolia ‘Argentea’, Silver Fountain Butterfly Bush. This butterfly bush blooms earlier than the other species and cultivars of Buddleia. This large shrub does well in most soils and sites but doesn’t like its roots to stay wet. 12-15’ Ht. x 10-12’ Wd. Caryopteris x clandonensis ‘Blue Mist’. Blue Mist Spirea is also in the Mint Family, and is not a true spirea, but has flowers that resemble those of the spirea. It is a hybrid of C. incana x C. mongolica that was created in the 1930’s in England by Arthur Simmonds. There are several cultivars of Caryopteris x clandonensis that are good choices for Colorado and which bees and butterflies (see photo below) love. 3-4’ Ht. x 2-3’ Wd. Mahonia. This genus has several members whose flowers will delight your winged friends. Mahonia aquifolium is a familiar shrub known as Oregon Grape Holly. It is evergreen, easy to grow and produces edible (but not tasty) berries from the yellow flowers that bees appreciate. 4-6’ Ht. x 4-6’ Wd. Prunus bessyi, Sand Cherry 4-6’ Ht. x 4-6’ Wd. Philadelphus lewisii, Cheyenne Mock Orange 5-7’ Ht. x 4-6’ Wd. Rhus aromatica ssp. Trilobata, Three leaf sumac 3-6’ Ht. x 3-6’ Wd. Rosa woodsii, Wood’s Rose 3-6’ Ht. x 3-6’ Wd. Tilia cordata, Little Leaf Linden. Linden trees perfume the air in springtime and offer up small yellow flowers (see photo below) for pollinators. I’ve heard that in Eastern Europe, a type of beer is flavored with the linden flowers. 30-50’ Ht. x 25-35’ Wd. (depends on cultivar). Apple / Crabapples. The Malus genus offers many species and cultivars that are attractive to bees. In fact, if there were no bees, you probably would not get any fruit from your apple trees. Ht. and Wd. varies depending on cultivar. Prunus armeniaca ‘Moongold’, Moongold Apricot. 15-25’ Ht. x 15-25’ Wd. Prunus nigra ‘Princess Kay’, Princess Kay Plum 15-20’ Ht. x 10-15’ Wd. Catalpa speciosa, Western Catalpa 40-60’ Ht. x 30-50’ Wd. Cercis Canadensis, Eastern Redbud 20-30’ Ht. x 20-30’ Wd. Crataegus ambigua, Russian Hawthorne 15-25’ Ht. x 20’ Wd.